(Reuters) - Regulators in Hong Kong and New Zealand said on Tuesday that they are investigating banks' conduct in the foreign exchange market as part of an investigation tied to the global probe into FX markets. The move shows that the regulatory crackdown on the $5.3 trillion-a-day-market is escalating and continues to broaden from Europe to other parts of the world. 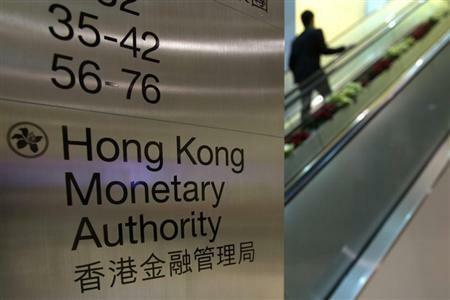 The Hong Kong Monetary Authority (HKMA) said in a statement after an inquiry from Reuters that it is requiring several banks to conduct independent reviews of their FX divisions and to then send the HKMA the results. "The HKMA is investigating into a number of banks in Hong Kong," an HKMA spokeswoman said in the statement. A spokesman for New Zealand's Commerce Commission said it had also started looking into the matter. "We've got an investigation but that's all we're saying because it's an active investigation," a spokesman for the commission told Reuters. Regulators in Hong Kong, the third largest foreign exchange market in Asia after Singapore and Tokyo, said in October they were in contact with foreign regulators about the matter, but this was the first time they have confirmed actual investigations are taking place. Market watchdogs around the world are looking closely at traders' behavior on a number of key benchmarks, spanning interest rates, foreign exchange and commodities markets. Several banks and brokers have already been fined billions of dollars for manipulating benchmark interest rates, but the foreign exchange probe could prove to be even more costly given the size of the market and scale of investigation. Authorities are looking at whether traders from different banks worked together to influence currency prices and if they traded ahead of their own customers or failed to accurately represent to customers how they were determining the prices. The probes are looking at whether a handful of senior traders colluded to use knowledge of client orders to move markets around the daily "fixings", which set prices for billions of contracts and investments worldwide. Singapore's central bank, which oversees dealers in Asia's largest foreign exchange market, said in October that it was in contact with foreign regulators about the issue but has not provided any further comment on the matter since then. News of these probes come a day after Swiss and British regulators both stepped up their investigations into the matter. Switzerland's competition commission WEKO said it formally opened an investigation into several Swiss, British and U.S. banks, including JP Morgan Chase & Co, Barclays PLC and Citigroup Inc.
Around 30 traders are known to have been placed on leave, suspended, or fired as a result of the probe. A source told Reuters on Monday that Kai Lew, a director of institutional foreign exchange sales at Deutsche Bank AG has been placed on leave as part of an internal investigation into potential manipulation. Lew was based in London and responsible for central bank FX business at Deutsche, the world's largest currency trader. There is no evidence she has been involved in wrongdoing and she could not be reached for comment. Last week Swiss bank UBS AG, the world's fourth largest FX bank, suspended up to six currency traders in the United States, Zurich and Singapore. Deutsche Bank and UBS together see around a quarter of the $5.3 trillion that flows through the global market on an average day, according to the latest Euromoney poll.